Theralac probiotic is very beneficial for yeast infections because of its patented delivery system that allows the bacteria to survive the stomach acids intact. This delivery system is made from seaweed and grape skins and is unique and exclusive to the manufacturer, no other company has it. 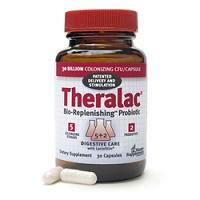 Theralac is a well balanced probiotic with acidophilus species and bifidobacteriums. That is what you need because bifidobacteriums are the largest bacterial species in the intestine. 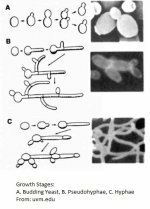 Studies have shown that some yeast can live right alongside acidophilus without any problems but not bifidobacteriums. Formulated at 40 Billion Colony Forming Units - Guaranteed at 20 Billion Colony Forming Units (CFU) through expiration. Two prebiotics that stimulate probiotics - LactoStim® (patent pending) and Lactoferrin. Natural acid-proof gel formulation utilizing sodium alginate and grape skin extract protected by US patents 7,122,370 and 7,229,818. All these bacteria are symbiotic to one another and do not compete but complement each other. Studies have shown that the #1 “molecular effect” of these bacteria is the production of lactic acid deep in the GI Tract; and with Theralac's patented delivery system and LactoStim™ prebiotic stimulation produced more lactic acid than any other probiotic. For example, 1% lactic acid production in 24 hours is considered a good result. This probiotic produces 1.3% to 1.6% in 12 hours. This test was performed by an independent laboratory, Minnesota Valley Testing Lab, in New Ulm, MN. Lactic acid kills yeast and bad bacteria. It also contains a patented prebiotic called LactoStim™ that feeds the bacteria without the sugar like most prebiotics. Lactostim is made from Lecithin and Oelic acid, both are fatty acids and sugar free so they won't feed the yeast. It is made at a dose of 40 billion per capsule and guaranteed to be 20 billion upon expiration. It is heat stable so it will not spoil and grow molds. They suggest one capsule a day for two weeks then 2 capsules a week there after as maintenance. This dose will vary per individual depending upon your own bacterial levels and level of infection so you may have to take more. One of the prebiotics in this probiotic is lactoferrin. Lactoferrin is an iron binding protein found in every body fluid and a proven immune system stimulator, more information on lactoferrin here. Bad bacteria and yeast use excess iron to reproduce and multiply and cause infections, it's food for them. By binding it it is not accessible to these bad pathogens but it is to good bacteria who require much less iron. In a study done on 206 h. pylori patients. Probiotics in combination with lactoferrin increased recovery rates by 16% over those that did not take probiotics with lactoferrin. Bullen JJ et al, FEMS Immunol. Med. Microbiol. 2005;43:325-30.). Theralac was recommended in Prevention magazine for irritable bowel syndrome and to strengthen the immune system. The immune system is very important when fighting yeast infections because they are so hard to ge rid of. Restores beneficial microflora after antibiotic treatment: J. Medical Microbiology 2009; 58, p663 (randomized, double blind, controlled study). One of the most effective ways to take probiotics is to rotate between different probiotic products. Often though you have an overlap of species or they are not always compatible. 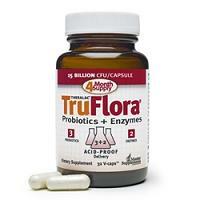 The manufacturer has solved this problem by introducing TruFlora™. TruFlora™ contains three probiotics called B. coagulans, L. plantarum, and L. salivarius plus two betaglucan digesting enzymes, Betaglucanase at 400 BGU and Hemicellulase at 10,000 HCU that work together within the contents of the G.I. tract in a bio-cleansing action. What's interesting is Hemicellulase is a candida yeast eating enzyme found in products like Candex and Candida Yeast Management. Betaglucanase is also an effective enzyme for yeast infections. Because of this, Theralac with Truflora would also be a very good probiotic to take for maintenance and the prevention of yeast. Take Theralac the first day and Truflora the next day, then Theralac the next and Truflora the next and so on. Once you get back to normal you can space it out every 3 days for maintenance. What you will be doing with this rotation is providing necessary bacteria for immune system defense and the next day you are doing a cleansing action. The company calls it Biotherapy and Bio-cleansing. They also guarantee both constipation and diarrhea will be corrected, digestion and absorption of critical nutrients will improve, and energy levels increase. Any questions about Theralac or Truflora or yeast infections in general? Feel free to contact me through the contact page on this website.